Image above courtesy of the College of Dupage. If you were monitoring weather on September 24th, 2012, chances are you were appalled to see the entire eastern US satellite imagery missing from your maps. What happened!? Well it turns out GOES-13, the satellite which covers the Eastern US, was experiencing tremendous interference the week prior to the blackout and on the 24th - NOAA decided to place the satellite on standby. This caused the east coast of the US to go dark for several hours. To fix the problem, NOAA briefly set GOES-15 (which covers the Pacific and western US) to "full disk scan mode" in order to cover the eastern US, however this did not cover the eastern US accordingly and other polar orbiting satellites weren't filling in the data sufficiently. 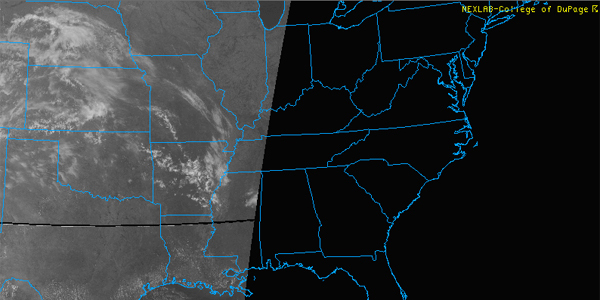 A back-up satellite, GOES-14 has now been positioned to cover the eastern US. Unfortunately, NOAA engineers have not yet determined a fix for the malfunction of GOES-13 and no time table has been given. NOAA doesn't sound hopeful with regard to GOES-13, saying, "GOES-14 will remain the primary GOES satellite over the Atlantic basin and Continental US until the imager and sounder data issues on GOES-13 can be fully diagnosed and hopefully fixed." So for the time being, GOES-14 will remain in service providing crucial information to meteorologists and providing data to computer models. Let's just hope GOES-14 (launched in 2009) stays in good shape as another GOES satellite is not expected to launch until 2015.